Elliot Sandy scored twice and set up another as Corby Town hit back from two successive defeats with a 3-2 success over Aylesbury United at Steel Park. After a tough few days for the Steelmen, who were the victims of a break-in at their stadium earlier in the week, the team provided some welcome relief on the pitch as they got their Evo-Stik League South Division One Central right back on course. Despite there being five goals, it wasn’t a game of many chances but, in Sandy, the Steelmen had someone who was ready to take the opportunities that came his way. And his finishing ultimately proved to be the difference as Corby stayed in contention at the top end of the table. Steve Kinniburgh made one change to his starting line-up following last weekend’s 3-1 home defeat to Thame United with Greg Ling coming into the side while Sam Grouse dropped to the bench. After a quiet start, it was the visitors who created the first real chance when Jake Bewley crossed from the left but Tre Mitford couldn’t get a good enough connection in front of goal. But the Steelmen responded and their only two chances of the half saw them open up a 2-0 lead with Sandy heavily involved in both. The striker skipped past a defender and then threaded the ball through for Jordan Francis to run on to. 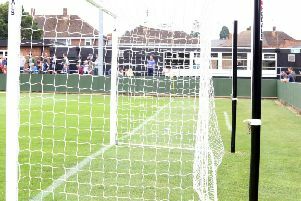 Aylesbury goalkeeper Jack Hopwood should have been quicker off his line but Francis made no mistake as he slid the ball home. One became two 10 minutes later and this time Sandy was the scorer. Jordon Crawford provided the opportunity with an excellent through ball and Sandy produced a low finish under Hopwood. It all looked good at that stage but Corby’s defensive frailties struck again as the visitors found a way back into things. There was indecision in the home penalty area before Jack Wood tried his luck with an overhead-kick, which looped over Dan George and dropped into the net. And Aylesbury drew level just six minutes when Mitford got in behind the backline and had time to take a touch before beating George. The visitors started the second half brightly but it was Corby who grabbed what proved to be the decisive goal just before the hour. And it was Crawford and Sandy who combined again with the former fizzing a cross in from the right and the latter applying the finishing touch with a header. There were few chances at either end after that but, as the game went on, Aylesbury pushed forward in a bid to find the equaliser. George produced a good stop to deny Mitford and then, deep into injury-time, Wood really should have grabbed his second of the game but could only shoot into the side-netting after a free-kick had been sent towards the far post. Steelmen: George; Kennedy, Mulligan, Anton, Warburton; Bradshaw, Ling (sub Bettles, 76 mins); Francis (sub Grouse, 85 mins), Carta, Crawford; Sandy (sub Allen 90 mins). Subs not used: McBride, Robinson. Aylesbury United: Hopwood; Hogg, Wood, Prosper, Peake-Pijnen; Hercules (sub H Jones, 76 mins), O Jones (sub Aghadiuno, 67 mins), Williams, Bewley (sub Berry, 78 mins); Mitford, Seaton. Subs not used: Mapley, Davis. Goals: Francis (15 mins, 1-0), Sandy (25 mins, 2-0), Wood (29 mins, 2-1), Mitford (35 mins, 2-2), Sandy (59 mins, 3-2). Bookings: Bewley, Hercules, Ling (all fouls). Northants Telegraph man-of-the-match: Elliot Sandy - a good day for the frontman. He created the opener for Jordan Francis and then scored the other two to give Corby victory. He did a good job at linking up the play but it’s those goals that really matter. On a day when chances were actually at a premium, Sandy scored the two that came his way. And that, ultimately, was the big difference between the two sides.